Designed for serious hobbyists and deadline-oriented individuals, clear 1.75mm Elite PLA Filament from BuMat has been built to deliver consistent filament diameter in order to help ensure the print head extrudes filament properly and extruder failure is virtually eliminated. 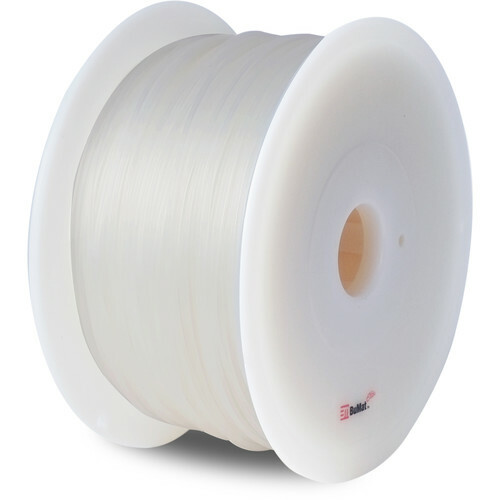 This 1kg (2.2 lb) filament is provided in airtight vacuum packaging, allowing for prolonged storage and greater resistance to moisture. Made from polylactic acid (PLA), it is biodegradable and can be used in closed environments. Additionally, it can tolerate print temperatures ranging from 320 to 356°F and is compatible with most 3D printers that use 1.75mm PLA filament. Box Dimensions (LxWxH) 8.4 x 8.2 x 2.9"
1.75mm Elite PLA Filament (1kg, Clear) is rated 2.0 out of 5 by 1. Rated 2 out of 5 by Scott from says red, looks orange, no temperature label I bought red, but this filament looks orange to me, maybe a reddish orange. The spool/packaging has no temperature guidance. The brands I normally use always give the temperature range. So I check the Bumat web site for Elite red PLA and the closest I find is luminous red (http://www.bumatusa.com/products/bumat-elite-luminous-red-pla-filament-1-75mm-2-2-lbs/) which says Print Temperature: 160-180C but this filament doesnt actually print at those temperatures. My spool is labelled red so maybe it is not luminous red that I have. I am able to print it at 210-225, but Im having more trouble than usual with build plate adhesion. The spool hole diameter is slightly smaller than all the rest, so it doesnt fit on my printers spool holder. Will not buy again.